With one flick of a card, Manchester United’s hopes of a truly historic season were wiped away at their moment of greatest plausibility. Despite taking an away goal back to Old Trafford, Sir Alex Ferguson’s men were still rated second favourites before welcoming Real Madrid. For the majority of a fascinating match, the hosts comprehensively proved the bookmakers wrong with a tactically perfect performance that threatened to turn talk of a treble into more than a pipe dream. “The best team lost,” admitted Jose Mourinho after the match. Anything else would have been disingenuous. Just as United great Gordon McQueen put it, the Portuguese had proved to be still just a pupil before the managerial master. 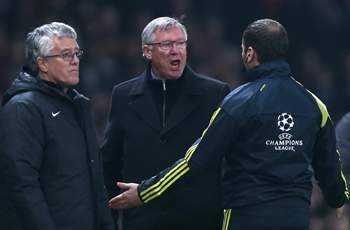 By Greg Stobart at Old Trafford“Well, if you canvassed the opinions of the supporters here, the verdict would be unanimous: the referee cost Manchester United a place in the quarter-final of the Champions League. “‘Robbery’ say the fans as they file past the press box, and I’d expect Sir Alex Ferguson and the United players to share that view. The real frustration from a United point of view is that going down to 10 men completely undid a gameplan that had worked so well. They were the better team, defending with organisation and always a threat on the counter-attack. Sir Alex had set his team up flawlessly to flummox Madrid. Fans were wide-eyed when news broke that Danny Welbeck had been preferred to Wayne Rooney but the decision to station the young forward directly against Xabi Alonso was inspired. The United boss observed just before kick-off that the former Liverpool midfielder is the lynchpin of Los Blancos’ play and so it proved, with Welbeck stifling him so much that Madrid struggled to get any kind of service to homecoming king Cristiano Ronaldo. Alonso was restricted to just 16 passes in the first half with an accuracy of 69 per cent as the hosts shut down their opponents with distinctly Mourinho-esque ruthlessness. But the space opened up for both him and substitute Luka Modric when Welbeck was forced out to the left flank – a change enforced by Cuneyt Cakir’s decision to send Nani off. Some, including United icon Roy Keane, argued that, whether or not the winger had intended to catch Alvaro Arbeloa in the chest, he should have had the awareness of his surroundings not to bring his foot up so high. Others compared it to Nigel de Jong’s infamous “karate kick” on, ironically, Alonso in the World Cup 2010 final. But the overwhelming reaction was shock at the harshness of the red card. It is hardly a rare occurrence for a player to trap a ball in midair with his foot, and Nani’s focus was squarely on his prize while Arbeloa careered in from outside his field of vision. The collision crunched but the full-back had hardly shied away from it; a yellow would surely have been more appropriate. Sir Alex fumed and the Old Trafford crowd erupted. Mourinho must have shuffled uncomfortably in his seat at the memories of all the times he had complained at such luck befalling Barcelona. United were shaken and, with the help of Modric’s introduction, Madrid creditably seized their opportunity to flex their creative muscles. The Croatian made one of the most vital contributions of his stop-start Blancos career so far with his confident playmaking and magnificent strike for the equaliser, leaving Tom Cleverley for dead before rifling past David de Gea. The near-obligatory Ronaldo goal came swiftly afterwards as the visitors pressed their advantage – but that the forward’s celebration was as muted as his overall performance spoke for United’s fine efforts as much as it did his own history. The Portuguese received a louder reception than even milestone man Ryan Giggs, who marked his 1000th senior appearance by doing his part to keep Ronaldo quiet in an unfamiliar right-wing role. The Welshman has had his senior moments over recent years but stepped up to the plate when it counted with energy and some fantastic passes; another who did not deserve to be on the losing side. Lesser teams would have collapsed completely to the Madrid machine but United came back and were comfortably on top for the final 10 minutes. If it had not been for Diego Lopez’s improved second-half performance in the Spaniards’ goal, an even more extraordinary result could well have been theirs. Welbeck, Giggs, Rafael, Nemanja Vidic, Nani … to a man, Sir Alex’s men were superb. Their exit feels like an injustice; it would have been fascinating to see how they coped in the latter stages after addressing many of their early-season criticisms. Now they can only focus on closing out a foregone Premier League conclusion and the secondary prize of the FA Cup, wondering what might have been. Madrid, meanwhile, sail on with ‘La Decima’ in their sights but the task will only get harder. United have provided the perfect blueprint for foiling Mourinho’s plans and others will surely follow. Not every referee will prove so crucial as Cuneyt Cakir.